A bag valve mask, abbreviated to BVM and sometimes known by the proprietary name Ambu bag, is a hand-held device used to provide positive pressure ventilation to a patient who is not breathing or who is breathing inadequately. The device is a normal part of a resuscitation kit for trained professionals, such as ambulance crew. The BVM is frequently used in hospitals, and is an essential part of a crash cart. The device is used extensively in the operating room to ventilate an anaesthetised patient in the minutes before a mechanical ventilator is attached. 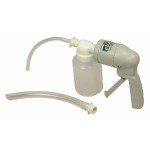 The device is self-filling with air, although additional oxygen (O2) can be added. Use of the BVM to ventilate a patient is frequently called "bagging" the patient. Bagging is regularly necessary in medical emergencies when the patient's breathing is insufficient (respiratory failure) or has ceased completely (respiratory arrest). 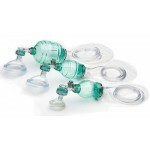 The BVM resuscitator is used in order to manually provide mechanical ventilation in preference to mouth-to-mouth resuscitation (either direct or through an adjunct such as a pocket mask). SMART BAG® MO "Improving Ventilation One Breath at a Time" The SMART BAG® MO has been desi..
Easy Grip® Silicone Autoclavable Bag-Valve-Mask Resuscitator Performance, Quality, when seco..
Easy Grip® Disposable Bag-Valve-Mask Resuscitators Unbelievable Quality at an Unbelievable P..
eVAC Hand Operated Suction Pump Typical Application - Emergency asp..